Companies such as GE, Ford and Mattel are pushing 3-D printing further into the mainstream than most people realize, writes The Wall Street Journal (June 6, 2013). Unlike traditional techniques, where objects are cut or drilled from molds, resulting in some wasted materials, 3-D printing lets workers model an object on a computer and print it out with plastic, metal or composite materials. Ford Motor The auto maker sees a future where customers will be able to print their own replacement parts. A customer could log onto the Web, scan a bar code or print up an order, take it to a local 3-D printer, and have the part in hours or minutes. 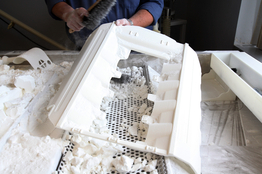 Ford is currently using 3-D printing to prototype automobile parts for test vehicles. Ford engineers use industrial-grade machines that cost as much as $1 million to produce prototypes of cylinder heads, brake rotors, and rear axles in less time than traditional manufacturing methods. Using 3-D printing, Ford saves an average of one month of production time to create a casting for a prototype cylinder head for its EcoBoost engines. The traditional casting method, which requires designing both a sand mold as well as the tool to cut the mold, can take 5 months. General Electric GE’s Aviation unit prints fuel injectors and other components within the combustion system of jet engines. Building engine airflow castings by melting metal powders layer by layer is more precise than making and cutting the parts from a ceramic mold. Mattel The toy maker used to sculpt prototypes of toys from wax and clay before building the production models out of plastic. Today, Mattel engineers use any of 30 3-D printers to create parts of virtually every type of toy that it manufactures, including popular brands such as Barbie, Max Steel, Hot Wheels cars and Monster High dolls.